THE FANTASTIC HAGGIS NEEPS & TATTIES a true Scottish extravaganza on a plate. I am an expert, having eaten maybe a half ton in my life (guessing here), with more to follow. 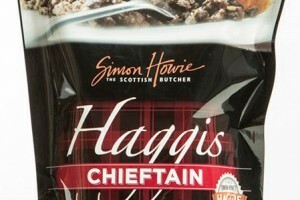 One of my favourites is Simon Howie haggis made from traditional recipe by award winning chefs and butchers. Their original 454g Haggis is the UKs best-selling haggis for the second year in a row. (Source: Nielsen Scantrack 52w/e 06/05/17, Volume Sales) As well as being Scotland’s national dish eaten to celebrate Burns night in January, haggis is hugely versatile and can be enjoyed all year round. Howie is a Perth company. Health Benefits Of Haggis Haggis is Scottish and although people are put off by its’ description, if you’ve ever tried it, you’ll know just how amazing it tastes. Haggis is made with sheep heart, lungs, and liver, all minced together with onions, suet, salt, spices, oatmeal, top quality meat and vegetable stocks, as well as a touch of whisky. The ingredients are then packed into the stomach of the animal and are gently boiled. Now, when you read it like that, it may not sound all that pleasant, but when you taste haggis, you instantly understand why it is so popular, as it tastes divine, if you are vegan or vegetarian, you can now buy vegan haggis which replaces the offal with fresh vegetables so anyone can enjoy the taste of haggis – meat or not! But what makes it healthy? Rich in Vitamins. Haggis contains top quality offal, including heart and liver. Both of which are full of vitamins that do the body a world of good. In particular, haggis is rich in vitamins A, C, B6, B12, Niacin, and vitamin D. These vitamins strengthen the immune system, promote energy production, promote healthy vision, and assist with nutrient uptake from other sources. Rich in Minerals. It is the mineral content that makes haggis so healthy. Offal is notoriously rich in minerals, and the ingredients in this dish do not disappoint. 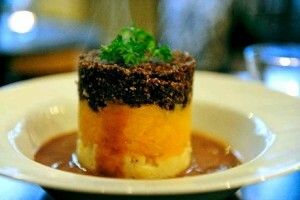 Thanks to the heart, lungs, and liver, haggis is packed full of iron, magnesium, selenium, calcium, zinc, and copper. These minerals contribute towards healthy immunity, they strengthen the bones, they regulate hormone levels, they promote healthy circulation and oxygen transportation, and they can even help lower blood pressure. Great Source of Protein. Liver and heart, in particular, are both packed full of proteins and amino acids, which promote cellular health and function and assist with the growth and repair of muscle tissue. Health benefits of tatties Mashed tatties are simply mashed potatoes and they are very healthy. Some primary health benefits include: Great source of energy As potatoes are rich in carbohydrates, they have a very low glycemic index, so insulin levels will not spike following consumption. What will happen, however, is that your muscle glycogen levels will be replenished. Rich in Potassium is another mineral required by the body, that not only helps to reduce lactic acid build ups and muscular fatigue, but it also helps regulate blood pressure. A potato actually provides almost twice as much potassium as a banana. Health benefits of neeps or turnips are a staple food served alongside tatties and haggis. Some of their key health benefits include: rich in antioxidants Turnips are packed full of phytonutrients and antioxidants, including glucosinolate, which inhibits tumour growths, helps rid the body of toxins, strengthens the immune system, and fight the harmful effects of toxins and carcinogens. Great for the heart – rurnips are rich in folate, a B vitamin which has been found to lower harmful LDL cholesterol levels and promote cardiovascular health in the body. Great for the bones – turnips are rich in calcium, which is a mineral that is vital for optimal bone health. By combining turnips with haggis, your bones will absorb much more of the calcium from these root vegetables, helping to keep them strong and healthy. Haggis & whisky crisps (chips to my American family) Mackie’s Crisps are the creation of an award winning family business – Mackie’s at Taypack Ltd. – which was founded in 2009 as a joint venture between Perthshire potato farmers, the Taylor family, and Mackie’s of Scotland, renowned for their luxury ice cream. The Taylor family have been growing potatoes in Perthshire for generations. The Mackie’s have over 20 years’ experience in ice cream from their farm in Aberdeenshire. All crisps are made in Perthshire, a few miles from the Taylor’s family farm, ‘Moncur’. Ingredients – potatoes, high oleic sunflower oil, whisky & haggis seasoning (7%) (sugar, yeast extract powder, spice, yeast powder, barley malt extract, rusk (wheat), natural flavourings, sea salt, onion powder, acid: citric acid, oatmeal powder, natural clove flavouring. Makie’s is a Perth company. Of course you must use a whisky sauce or better still a few drams of whisky in a glass to down with the above. Whisky sauce is a sauce in Scottish cooking, has become popular globally. It is created by pouring an amount of whisky into a saucepan. It is then set alight, in order to make sure that the sauce is not too bitter. Double cream is added whilst stirring. The heat is then reduced so that the sauce can thicken and finally seasoning such as salt and pepper is added, the documentation of whisky in savoury cooking goes back to at least Victorian times, where its use in meals is documented in Isabella Beeton’s famous cookery book Mrs Beeton’s Book of Household Management. Due to the Scottish nature of the sauce, recipes including whisky sauce have been popularised as dishes to be eaten on Burns supper along with the traditional main course of Haggis – or any time of year. Scotland’s national chef Gary Maclean and Simon Howie delicious haggis recipes with a twist. TV’s Masterchef: The Professionals winner Gary Maclean’s show-stopping haggis dish took him to the show’s finals, and he’s got a few more tricks up his sleeve for our national dish. Working with Howie, the duo have come up with three exciting recipes to re-invent the Scottish staple, including crispy fried haggis, haggis burgers and haggis Yorkshire puddings. Maclean’s Crispy Fried Haggis, first seen on MasterChef: The Professionals, turns the classic texture of haggis on its head, shallow frying Simon Howie haggis wrapped in a light filo pastry and combining it with a red onion chutney, mashed potatoes and roasted turnip. http://www.thescottishbutcher.com/recipes/haggis-recipes/gary-macleans-crispy-fried-haggis GARY; Born in Glasgow, this multi-award winning chef has been hailed as a major talent, a gentleman of the kitchen, a world class educator and one who could step into a three Michelin-star kitchen and feel at home. Gary Maclean, husband, father and chef – is one of a kind. He of course is a Maclean, say no more. 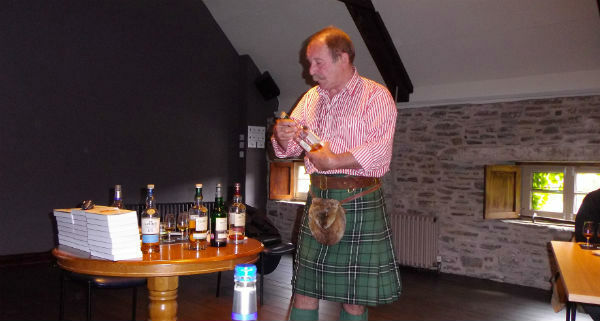 PAUL MCLEAN Michelin (tyres) awarded whisky drinker. If you come on any of our Scottish tours, you are likely to come up against the age old problem “do I try haggis or not?” Honestly, the amount of people who tried have agreed it is delicious, similar to a stuffing maybe you put in a turkey. Like whisky and golf, you cannee go far in Scotland without coming in touch with the wee haggis, breakfast, lunch, dinner, snacks, deep fried or with chips. It does NOT have a consistent taste as each chef will use his/her own recipe. My advice, try a nibble at breakfast, if you like it, get a larger portion later that day – with a dram.